I’ve seen birds go fishing many times. I have never seen a fish go birding. Thanks for letting me get that off my chest. But there’s more. For some reason I’ve been thinking about birds and fish. Birding and fishing. Birders and anglers. I haven’t met Mike but would like to, preferably over a meal. He often refers to good food. We could go to that Italian place with the zuppa di pesce he loves so much. I also know that Mike has at least a passing interest in birds, if not birding itself. He wrote a column in July that mentioned a bald eagle, an osprey and a pelican. Each bird played a role in one of his fishing adventures. That column also mentioned yours truly, although not by name. I was the “suburban birding guy” who’d emailed Mike to ask if he might devote a few words to birds. And he did! I’ll bet most fishermen know more about birds than they even realize. How could they not? Their sport offers considerable downtime. From a boat or a dock, there’s time to observe. Birders and anglers are kindred spirits. Please tell me if I’m wrong. We both get up early. The best action is often before 9:00 am. When the 5 a.m. alarm chimes, there’s a mutual feeling of anticipation. Birders and anglers know that surprises await. What will be seen? What will be caught? No matter what, we know it will be a good day because we’re doing what we love. Then there’s the lingo. Birders speak of butterbutts, chippies, sandies, sharpies and wormies. Anglers have their bronzebacks, lakers, smallies, silver kings and lunkers. We both use bait and sometimes chum around. We practice our hobbies alone and with others. Both ways are enjoyable but completely different experiences. We can easily bird and fish on a low budget. Or we can spend thousands on tools, accessories and travel. The technology for finding and catching fish is significant. More birders are using electronics, too. But the simple, old-school methods are still effective. At all hours, in all seasons, we’re out there. Night fishing. Ice fishing. Owling. Listening to the dawn chorus. Competition is available for those who seek it. Fishing tournaments exist for amateurs and professionals. Some take place this time of year atop frozen lakes. 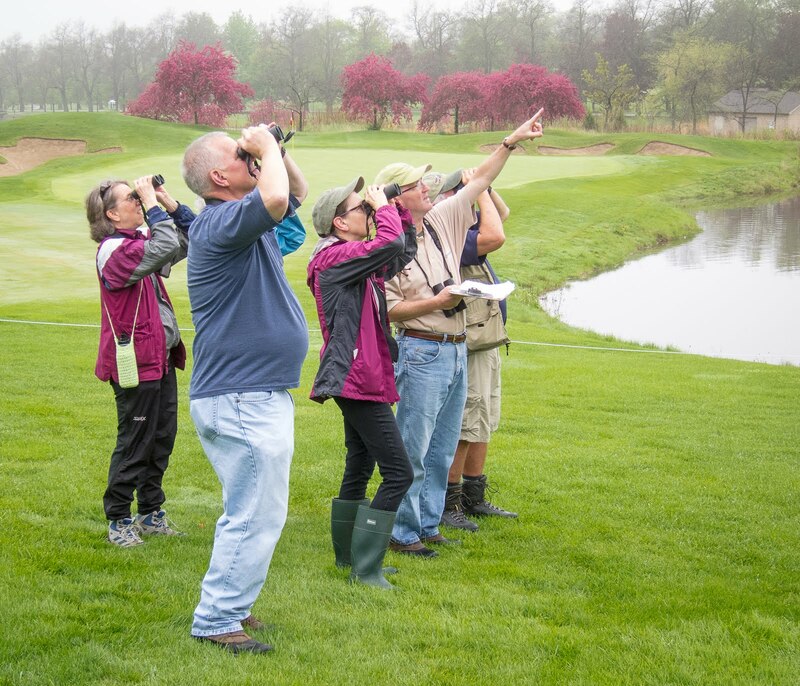 Birders have their Big Days and Big Years. And to prove our toughness, we watch hawks from the top of windy hills in late November, engage in all-day Christmas Bird Counts and scope gulls on the shores of Lake Michigan in the dead of winter. (It’s not dead for us). Some birders drive to frigid Duluth or Whitefish Point in January to witness northern species that rarely visit Chicagoland. We bird where the birds are. Devoted anglers have their favorite hole or secret spot. Birders have their local “patch.” The depth of their knowledge about these special places is often astounding. Anglers relish the spring bite and the fall bite. Birders covet the spring and fall migrations. Both enjoy a challenge. For fisherman it’s finding, hooking and landing. Fish that put up a good fight are preferred, like the smallmouth bass that get Mr. Jackson all fired up. For birders it’s finding and identifying, where sometimes a one-second glance is all you get. It’s the challenge of seeing birds we’ve never seen before, motivating us to get out more and visit new places. Patience may be the single greatest connection. Anglers and birders wait for The Moment, using all of their senses to anticipate and be ready. More often than not it eludes us, so we learn to appreciate the familiar and unremarkable. Rare is just a bonus. The process, not just the outcome, is part of the fun. I can’t speak for fisherman but I believe if you don’t enjoy the process and routine of birding then you are not long for the hobby. And did I mention the one that got away? Anglers are famous for these stories but birders tell them too. One of mine involves a likely ferruginous hawk in Colorado back in 2003. It should be on my life list but sadly is not. So, yes, we can relate to how our angler friends feel when they hook a monster bass, watch it surface, and moments later feel the line go slack. It hurts, we know. But let’s close on a more upbeat note as we begin a new year of outdoor discovery. Picture a group of happy birders and fishermen, gathered in a cozy Northwoods tavern, sharing tales of feather and fin. It was a good day in the woods and on the water. All are sporting khaki vests with lots of pockets, festooned with colorful hand-tied flies or birding pins, depending on each wearer’s persuasion. After a few longnecks the new friends disperse, retiring early to their cabins. A good night’s sleep is advised, because tomorrow, like today, starts before dawn.